Six months ago we sold our car and decided to go all in. We had already been cycling a lot, but the car was becoming an inconvenient convenience, mainly being used for ridiculous little trips like dropping off our youngest at kindergarten or going grocery shopping. The inspiration to make the bold move came from people like Mikael Colville-Andersen and his copenhagencyclechic.com blog and his copenhagenize.com movement – and Clarence Eckerson Jr. and his Streetfilms documentaries on livable cities. I was particularly inspired by his 2010 documentary Cycling Copenhagen Through North American Eyes. And hold on – not least because of all the initiatives provided by Copenhagen City Council, such as more and wider bicycle paths, green waves for cyclists in the mornings and afternoons – and just the kick you get out of being part of something great. So what’s my verdict after 6 months of full time cycling everywhere? I’ll probably never go back! And, mind you, that’s my verdict after having been through one of the toughest, coldest, longest and snowiest Danish winters in recorded history. 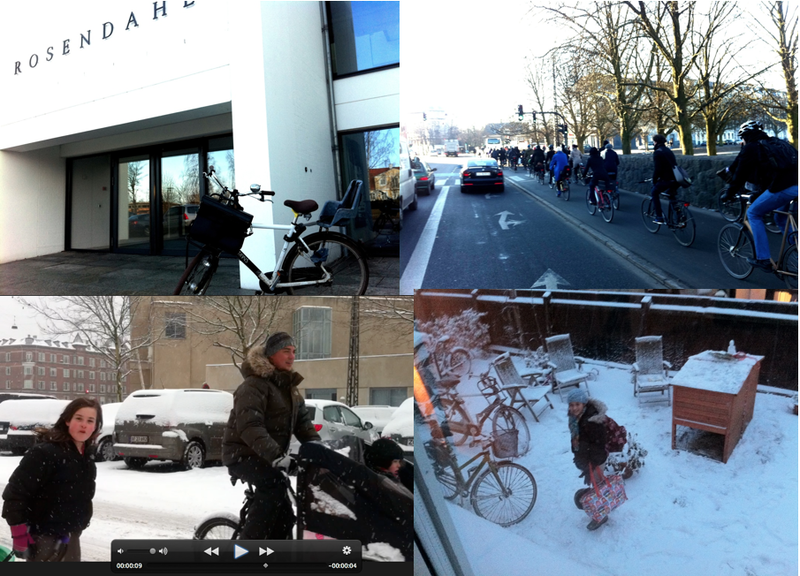 These are some pictures from my iPhone representing some of the ambiance of Copenhagen winter cycling. (I know, these are no match for the photos over at Copenhagen Cycle Chic). Let me say, I have challenged a lot of conventional wisdom over these last 6 months: I have cycled to meetings over 15 km away wearing a suit (top left, biked parked in front of my customer’s HQ). I bring my bicycle on trains all the time to bullet through town into the suburbs and continue for another 3 or 4 km by bike. I have plowed 3 km through 20 cm of snow with Halley (our youngest) on the back seat. I have managed more meetings in one day than I would have been able to driving a car (that’s a die hard myth). 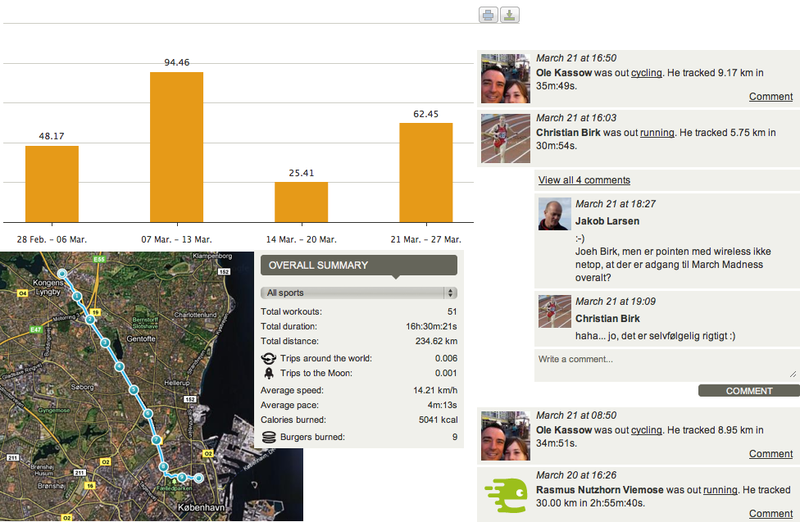 After I recently met up with Christian Birk, one of the founders of Endomondo, I decided to give it a try logging my cycling, and what a great motivator it is. I know exactly how many kilometers I have cycled, the average speed (not that it really matters), how many calories I have burned (ehem, not that it matters either), but it does tell me how many trips to the moon I’ve done. Alas, since I started on March 1st I have only made it 0.001 times to the moon, but I’ll let you know when I get there. All I really miss, gadget-wise, is a good sturdy, weather-proof iPhone mount, when I try to navigate using Google Maps, which, ironically, still doesn’t give me a cycling option in Copenhagen (only car, public transport and by foot). PS. Mikael from Copenhagenize did this cool blog post on me back in December: Ole’s ‘Old’ Autocar. Thanks Mikael.